Salon Restore® gives you the freedom to color with passion. And when hair color gets on your clothing, or your clients clothing, simply spray Salon Restore’s Miracle Dye and Ink Remover and the stain will wash out. It’s a special touch, a clean touch you might say, and an extra touch that you can offer your guests in the salon. And if color gets on the floor, on counter tops, or on furniture or sinks, try Salon Restore Quick Shot – the original – and easily remove hair color stains. 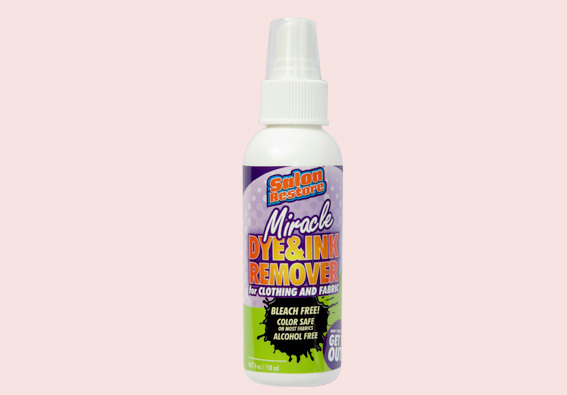 In fact you can use Salon Restore to remover color, ink, dye, markers, red wine stains, blood, juice drink, drink mixes like Kool Aid*, and even for sticky adhesive and price striker residue – it get’s all that stuff out! And because Salon Restore® is Bleach-Free and Alcohol-Free it’s safe to use on colors and patterns; simply spray Salon Restore and then the next time you wash the stain will come out. Even if the stain is not fresh you can still get it out! You touch every client with passion, now you can touch every client with CLEAN. For June and July, enter code ‘JJCLEAN’ for 15% OFF of any of our Kit deals. Shop Now. *Kool Aid is a Registered Trademark of Kraft Foods.